If you’re an animal lover, the opportunity to get up close to wildlife is arguably the highlight of any vacation. At these amazing hotels and resorts around the world from the United States to Australia, Africa and beyond, you’ll be able to interact with all sorts of incredible creatures. Capture photos, learn all about their habitats and behaviors, often while enjoying some fantastic scenery and a host of amenities too. This intimate hotel located just outside of Nairobi may be the world’s best spot for getting up close to giraffes. The manor that’s been described as something like walking into the film “Out of Africa,” with its sunny terraces, lovely courtyards and lush gardens, is home to a herd of Rothschild giraffes that frequently visit during morning and evening hours, sometimes going as far as poking their long necks into the windows of the 12-room boutique hotel. The original manor was built in 1932 and has served as a giraffe sanctuary since the 1970s- all of its profits go toward supporting the African Fund for Endangered Wildlife. Lapa Rios Ecolodge is nestled in a 1,000-acre private nature reserve in some of the last remaining lowland tropical rainforest on the wild Osa Peninsula. Its 17 thatched-roof bungalows are free from the buzz of smartphones, as well as the intrusions of TV and the Internet. Instead, guests can enjoy listening to the sounds of crickets, kinkajous, and cicadas and gazing at spectacular ocean views. Activities are numerous, including horseback riding on the beach, kayaking, surfing lessons, and hikes through the forest to spot three-toed sloths, pumas, monkeys, tree frogs, toucans, macaws and thousands of other creatures. Afterwards, soothe sore muscles with a massage and fuel your appetite at the onsite restaurant that serves local fare with jungle views. The all-inclusive Occidental Grand Xcaret is located in Mexico’s Riviera Maya region, about 10 minutes south of Playa Del Carmen. A wildlife lover’s dream, there are flamingos, scarlet macaws, white-tailed deer and iguanas that roam the grounds, with the occasional parrot coming out to surprise guests with a welcoming “Hola!” The hotel even has its own entrance to Xcaret Park next door where visitors can check out jaguars and pumas, bats, manatees and sea turtles, or even go swimming with sharks or dolphins. After a day with the animals, come back and enjoy a relaxing swim and an evening of entertainment. There are 11 restaurants and 10 bars on the property, including a swim-up bar at the pool. Run by the local kichwa-speaking Sani community who once worked dispersed among other lodges before coming together to operate this impressive lodge that offers one of the world’s best jungle getaways. Set deep in the Ecuadorian Amazon in a wildlife-rich corridor of rainforest between the Cuyabeno Reserve and the Yasuni National Park, it features 10 thatched cabanas that sit at the edge of a lagoon that allows guests to enjoy some of the best bird watching around, right from the dining room and a nearby tree tower. As it uses only solar energy, there tends to be a greater number of creatures here, including caimans that are nearly always lurking around the water at night. Sani community guides lead canoe and trekking excursions to introduce guests to their families in the nearby village as well as to watch for wildlife. With a name like Sea Lion Lodge you’d think it would be all about watching the sea lions here, but it’s the penguin that is the biggest attraction. The only hotel on Sealion Island in the Falklands, it offers expansive views of the South Atlantic Ocean and the chance to sit right alongside a colony watching gentoo, southern rockhopper and Magellanic penguins shuffle about. In fact, a rookery of gentoos often sets up camp right next to the establishment. Seals and sea lions can be found here too, while dolphins swim by in the shallows and the blows of various whale species are sometimes spotted in the distance. State Game Lodge is located right inside Custer State Park, a renowned wildlife sanctuary in the lush Black Hills of South Dakota where some 1,300 bison roam free. While you can often spot them on the lawns that surround the facility, Buffalo Safari Jeep Tours are offered daily from the lodge. You can also head out on your own for a drive on the scenic Wildlife Loop Road which traverses through 18 miles of pine-dotted hills and open grasslands, much of which the park’s wildlife calls home. Bison are often seen in large numbers, along with, elk, pronghorn, deer, coyotes, prairie dogs, bald eagles and wild burros. 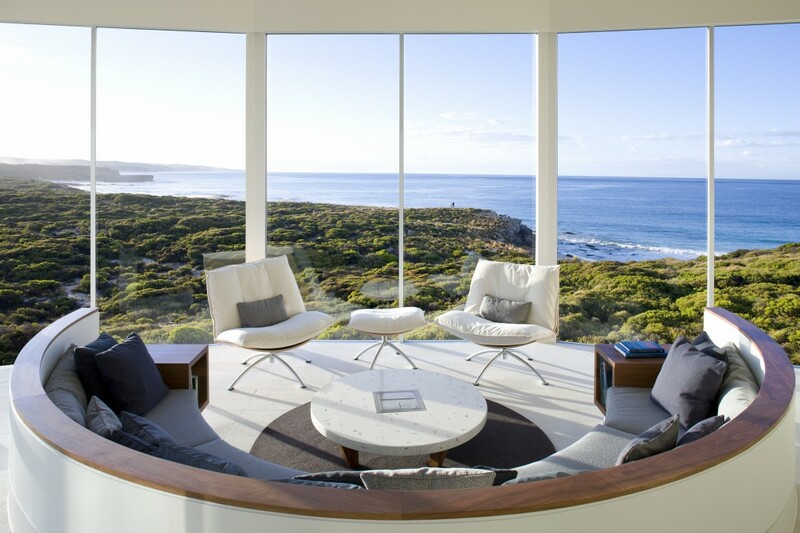 Kangaroo Island is often referred to as Australia’s Galapagos due to its wealth of endemic species. It’s not only home to kangaroos and koalas, animals that are synonymous with the land down under, but parrots, gliding marsupials, seals, dolphins, whales and more. The luxurious Southern Ocean Lodge offers the ideal base for exploring it, along with guided tours on foot, bicycle or kayak for encounters in this “zoo without fences.” Afterward come back and enjoy gastronomic delights at the award-winning onsite restaurant, spa treatments and mesmerizing views of the ocean from every suite. Great Bear Lodge is an eco-friendly, low-impact wilderness retreat on northern Vancouver Island in British Columbia that accommodates just 16 guests, and it’s regarded as one of the world’s best places for viewing grizzly bears. Biologist guides take guests out to experience close encounters with the bears and other native wildlife with a variety of excursions available. Afterward, a wilderness-gourmet meal made with lots of fresh, local, organic ingredients awaits, while the surrounding wood decks are ideal for sipping a drink while taking in the unspoiled forest scenery.